SL Newser - People: Interview with Nydia Tungsten about "Switched Destinies"
Nydia Tungsten is known for many things in Second Life, DJ, estate manager, community leader, video director, and writer. Of her writing talents, she has recently applied them to real-life. Earlier this week, she announced her novel "Switched Destinies" has appeared on Amazon. "It was a LONG time coming," Nydia told me of the story finally being published, saying it had taken "about eight months or so" to write. Of where the idea came from, "When I was 18 I think, I had a rough idea hit me. I tried to put it down then, (but) got poo-pooed by family, so I gave it up. ... It was too, strange for them. The lead character was a cougar, in a human world. This was WAY before I ever even HEARD the word furry (laughter). This was MANY moons ago." So what made her decide to give the story another try? She explained, "I was riding with my brother in his truck, spending many an hour just watching the world go by. Then one day I let my mind wander, and I found (the story) again. It was like saying hello to an old friend. I spoke to my brother about it, and he told me to get it out of my system and see where it goes. So he bought me a laptop and I started putting it down." "The next hurdle was finding someone to help editing it," she went on, "My daughter and a few others helped me with it. My daughter read it when she was, 12 I think. She took over my laptop and read it...and read it and read it, she would have read the whole thing in one go if I didn't take it away and make her go to sleep. When she did finish, she was raving about it and about how I HAD to publish it because (according to her) it was better than any of the 'Harry Potter' books she read. I told her she was just being nice and I almost had a fight on my hands (laughter)." So what is the story about? The description on Amazon is, "Two souls, viewed by many of their kinds’ as eccentric lunatics, suddenly find themselves switched within their parallel universes. Now in strange new lands, each is having to learn about the other side of the mirror. 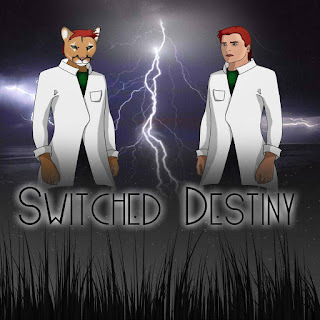 In the all new Switched Destinies.” The story is a science-fiction/fantasy one in which a human scientist, Kevin Baron, ends up changing places with his counterpart in a universe where the world is populated by anthropomorphic beings, or furries, such as cat people, rabbit people, and many other varieties. But a population made up of people looking like various animals is just the first surprise, "He finds a new culture and some shocking surprises, but also a few friends along the way." The society is roughly Medieval in technology, "Honor and status it what 90% of what their society is built on. Weapons consist of swords and bows, for the most part. Most can use some form of magic, and some can be really good with it. There are different 'classes' of people as well." From the human visitor's point of view, "the basic laws can be a bit, extreme, and how conflicts are handled." Nydia didn't want to give away too much of the story and the characters, "I am so proud of how they came together. I want the readers to enjoy the 'First Experience' for themselves. And the more they know in advance reduces that for them. I want them to experience like I did, as it happens whether it is to laugh or cry or wonder. They way they tell their story, you are carried along with them, as they learn about each other and their ways." When asked about what influences she had when coming up with the story, she answered, "I am not sure what inspired me to start it, but they, the characters, inspired me to keep going, to see what happens next." She's also started a sequel of both the further adventures of the human hero and his furry counterpart, "though my editor, my daughter, is now pushing me to write the story of what happens in the human world more. She is the self proclaimed "Expert" on my books since she has read them so many times. The second book follows the same time line as the first. The third takes place a few years later. So there are three, possibly four, more books coming." Does either hero find a way back to his home universe? Nydia isn't telling. One thing she was willing to reveal was the woman, a rabbit/raccoon hybrid or "mix," whom the human visitor ends up in a relationship with and marrying. 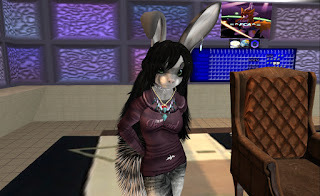 The character is named Nydia, but she didn't name her after her Second Life persona, but the other way around as she had developed her years earlier, "she is TOTALLY different from me, but when I started Second Life it asked me to come up with a name, and her name was the one that came out." She did have an avatar of the character in Second Life, "One of my (close friends), Jian, made an avi of her. I am SO proud of it. I only were it for special occasions, so I don't soil her image (laughter)." She then changed avatars to the appearance of the "Switched Destinies" character, and spoke to me as if the character, "Good Afternoon Bixyl, I am the Lady of Baron Manor Nydia Tangen." Of the character starting off with a low status in her society but ending up the second in charge of a noble house, "Since you know of what my station in life was, you know how shocked I was to get to where I am today. My spouse, may the Goddess bless him, hasn't a clue, nor care of any such status I may have had in the past. But just tells me 'I am worth it,' and he loves his 'Little bandit' to which I usually roll my eyes and laugh at his other worldly ideals. But I do love him, and will die for him if ever called to do so, we all would." And what did the character think some of the more odd things about humans and Earth? "Hmm, the shear number there are of you and your just ONE species, which you would think would make it easier to get along, but doesn't for some reason. And if I have to be honest, when I found out what some of you eat, I was a bit more than disturbed." Asking what that was, she answered, "Well, you eat rabbits and raccoons for a start. But what shocked me to the very core was ... well, my spouse told us ... dear Goddess ... we .. they taste like ..... chicken! And since I am a 'Mix' of the two, surely you can see why I would find that disturbing." And what did her spouse find surprising about this world's food? The character answered that it was that magic was sometimes used in cooking, "He was surprised by self-stirring bowls of all things. We were more shocked he actually knew which side of the pan to cook on. I mean, he IS male, so we were absolutely shocked! His first dish he made, didn't look very appetizing, like worms covered in blood. But it turned out WONDERFULLY! He called it, what was it again, 'spagetty?' My personal favorite was what he called 'cheesecake,' he put strawberries on it, oh dear Goddess, it was so decadent!" Others in the world caught interest in his food as well, "It was so odd, but good. It is now being server in 'Shelly's' in Hightown itself. Most refer to it as exotic. What adds to it is the fact that is was a MALE that created these dishes. ... There are NO male chefs anywhere. Men just can't cook." When asked about examples when they had to such as when lost in the wilderness, she answered, "Lost in the wilderness? A male? Never. They rarely even leave their towns." Asking the author if there was anything else she wanted to add, Nydia responded, "The meeting between my namesake and her spouse Kevin is an interesting one. She is a very honest an loyal woman. But, don't threaten her spouse or family. She has and will kill for them. ... I hope you enjoy our story." Shortly after the interview, Nydia announced that Amazon had published her book. "Switched Destinies" is available on Amazon for $5.00.